Happy Father’s Day! These last two 1/2 years with my husband I have really grown a love for this holiday because of all the fun new traditions we are starting in our new family. One of the traditions I started last year on my husband’s first father’s day was that I was going to give him homemade gifts, ones he could keep and love for a lifetime. With my daughter’s gift to my husband this year I took an idea from his childhood. 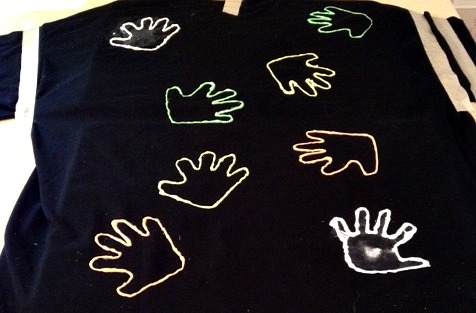 He has mentioned many times about how when he was growing up for many of the holidays his parent’s would have him and his siblings put their handprints on a shirt for the other parent. 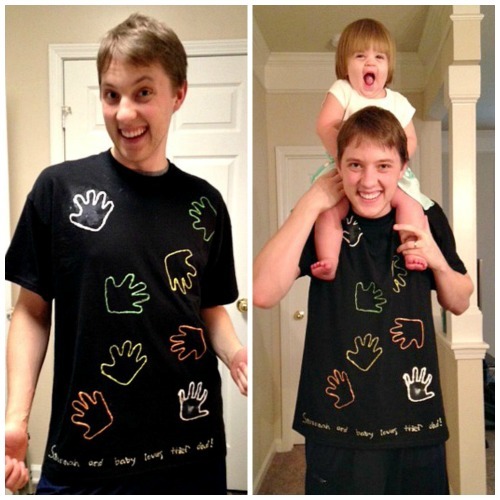 Since this was such a fond memory of his I wanted to keep it up in our family and make him one of his very own handprint shirts for this father’s day. Stencil of child’s hand if they are wiggly. I made our stencil by tracing my daughter’s hand on lined paper with a pencil and cutting it out with scissors. Something flat to put between the layers of the shirt, I used two baking sheets. 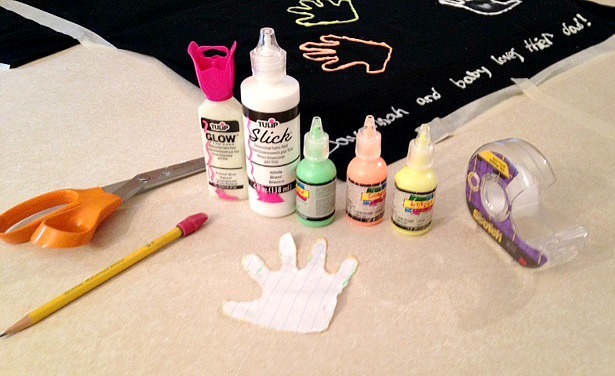 – Make the stencil of the child’s hand. -Put your flat objects between the two layers of the shirt and make sure the shirt is flat. -Tape the shirt down flat with masking tape on the arms, neck and sides. 2. For this step you have two options. -Option #1: Stencil. If you chose to use a stencil of your child’s hand than follow these directions. Roll a piece of scotch tape and stick it to the back of the stencil. Place the stencil on the shirt where you want a hand print. Outline the stencil hand with the color you chose. Make sure to fill in any gaps after you remove the stencil. Squirt some paint on your child’s hand. Rub the paint evenly around their hand. Carefully place the child’s hand on the shirt making sure to press each finger down along with the palm to make sure enough paint applies to the shirt. Carefully and slowly remove the child’s hand from the shirt. Repeat to desired amount of hand prints. After hand prints are done you can then outline them with the same or even a different color. 3. Add any designs or writing to the front of the shirt before you let it dry. 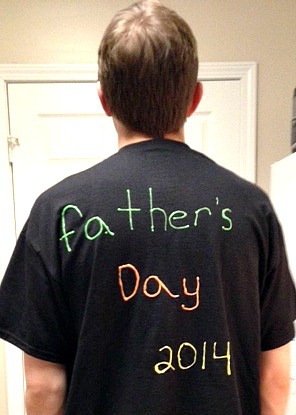 I added a sentence to the bottom of the shirt saying that Savannah loves her dad. 4. Let the hand prints dry. I left the shirt out over night just to make sure it was dry before I continued. 5. Write something on the back. I like to write what day the gift is for and the year it was given on the back of the presents I give on Father’s Day so that is why I went with what I did but of course you can do whatever you want! 6. Let the back dry, overnight again especially if you wrote a lot. 7. Give to the desired recipient or even keep for yourself! I am so lucky to have found such an amazing father for my children and one who loves my gifts even with spelling errors! I hope you all had a great Father’s Day! This is a great idea I love keepsakes with my children’s hands or feet on them. Of course they are getting bigger now 14,11,9,8,5 and don’t always want to participate but I love this idea so might just have to make them lol. I love this! What a great idea! This would be a perfect gift for any parent or grandparent. It would also be a great end of the year gift for a teacher. Thanks for the instructions! What a cute gift idea. Thank you for sharing. Awwww…so adorable! I would totally love to do this with the kiddos! Very cute idea!! I love this! THIS IS SUCH A GREAT IDEA. THEY WILL NEVER BE THAT SIZE OR AGE AGAIN IN THEIR LIVES ANY DAD WOULD LOVE THIS GIFT JUST FOR THE MEMORIES IT WILL BRING BACK. THANKS SO MUCH FOR THE IDEA. What a fun craft!!! I cherish anything with my girls handprints or feet prints (anything with either of these gets laminated and saved). It is neat to look back at how tiny their hands were. Such a great idea. My dad would have loved this! That is such a cute idea! My grandsons would love to help make this! What a great idea. This would make a great surprise gift for my daughter and son-in-law. Matching shirts would be so neat with all my grandchildren handprints on them. What a great idea, these are adorable! It sounds pretty easy to do. This is super cute! Love it! We love doing crafts. What a great idea for Father’s Day! My son’s school made a plaque with his handprint for Mother’s Day, which I thought was pretty awesome. A great keepsake! This is such a cute idea 🙂 I’m thinking I’ll have to do this next year! This is a really cute idea! I wish I had seen it in time for Father’s Day this year! Using the hand prints of the children to make keepsakes for their father on Father’s Day is very special. I always liked handmade gifts. Somehow the world got too commercialized on gift giving. What a great idea! This would be neat to do something with the handprints each and every year to see how much the children have grown!